Before I would give them any advice, I would accurately determine their motives. As both a visual communicator and a social/environmental activist, I have a very large responsibility to the public and the planet – as well as my own personal ethics. Clearly Green Design takes our commitment to the environment, animals and social justice causes very seriously so its critical that we understand the motivating factors for a company before we go any further. A green claim or green identity no longer has the same validity that they used to because of excessive greenwashing. Greenwash is rampant because so many companies have simply jumped on the green bandwagon in order to keep up with the trend. Personally, I find this really sad because there is alot at stake here – namely, planetary survival. A glaring example of greenwash are the green claims made by the Walmart corporation. I honestly don’t know how the folks at the communications agency who market Walmart can sleep at night. When you look at the big picture, there is not much good with that company. Walmart stores generally come into communities and develop on what used to be green space and habitat for plants and animals. They hurt smaller local businesses who can no longer compete against their low prices. They provide low paying jobs. They sell cheap crap which is often made overseas with questionable labour conditions and then proceed to ship this “stuff” halfway across the globe with no regard for the environmental footprint of the shipping industry. Most of this cheap stuff lasts less than a year and, inevitably ends up in an already overflowing landfill. And so, the dysfunctional cycle of consumption continues on and on. Many consumers can see right through these token green claims and this has caused huge mistrust. So, if a company wants to honestly market themselves as a green company, they had better make sure that they have looked very deeply at all aspects of their business or organization – environmental impact, social impact and the impact of their product or service on other species. Only then can they honestly portray themselves as being truly “green”. Once this “deep look inside” has been established, then identity and design will naturally compliment the true self of the client business or organization and the honesty will shine. The saying “honesty is the best policy” could never be more true. 2. What would you advise against? Obviously, certain imagery has been seriously overused and now instantly raises red flags with consumers. Polar bears, beautiful plants and trees, sweet animals…I’ve seen these images used on collateral for mining companies, paper producers, pharmaceutical companies, banks, etc. Let’s get real. Many of these companies could care less about the environment so who do they think they are fooling? This is what has caused the rampant mistrust in green claims in today’s era. Again, I just can’t stress honesty enough. If there are eco-weaknesses in the business model, be up front about them. No business is perfect and it better to not try and pretend that it is. That just raises red flags. Consumers and donors are much more inclined to be attracted to the shortcomings if the visual communication is honest. 3. What corporation or brand would you most want to re-design and why? There are actually two organizations who could use a solid re-design – and who we would love to work with. 1) The Humane Society of the United States (HSUS) – This organization does amazing work for animals throughout North America but they have a very dated look with all of their collateral – and their website is very difficult to navigate. Because we are so passionate about this cause, it would be amazing to completely overhaul their look. 2) Bullfrog Power – They are such an exciting and progressive company but their look is very un-exciting. They don’t seem to have the high profile that they deserve for the great work they do either. They provide an amazing product and exceptional customer service – they need to really shout that out to the world so that they get the business they deserve. 4. What do you wish more clients were doing in terms of design that was bold and out of the box? I wish more clients would be more open to a more exciting and edgy design to really convey the excitement of what they are offering. Not that this type of design solution is for everyone, but if you look at alot of sporting goods companies (i.e. snowboarding, biking, athletic shoewear), they often have high energy, colourful and edgy design solutions. They really convey the energy and essence of what they offer. This sort of design doesn’t have to be limited to sporting companies though because so many non-profit organizations and businesses have really exciting and vibrant campaigns and products which could use this sort of energetic design. Unless the target market is conservative and older, this type of design works for a really wide target market. I find that many clients seem to just follow the trends of their competition so that everything looks alike. Twenty years ago when I was still in design school, I had a commercial art instructor who said this: “when everyone zigs…zag!”. I never forgot that and that is the way we have always come up with our design solutions at Clearly Green Design. Zagging is a good thing! If a visual communications company suggests something different and edgy to a client, it may just be worth a listen! 5. What cool trends are you currently trying or seeing now? Well, I haven’t really seen any exceptional new trends lately. There is definitely still some very nice design out there but, perhaps it is the recession that is holding companies back…who knows. The trends I’m usually the most attracted to are the ones which are lively, colourful and edgy. In keeping with my own advice, I’m always trying to “zag” with our clients. Sometimes it works and other times it just needs to percolate a little more. Being “green”, socially aware and committed to the planet doesn’t mean that design solutions have to be serious and dull. As a matter of fact, they really should be anything but that. This is an exciting time and it really needs to be conveyed in an exciting manner. This is what we are doing with our own design for our current and upcoming clients. I’m hoping this will be a trend which really takes off because the public needs this – especially during these turbulent times. 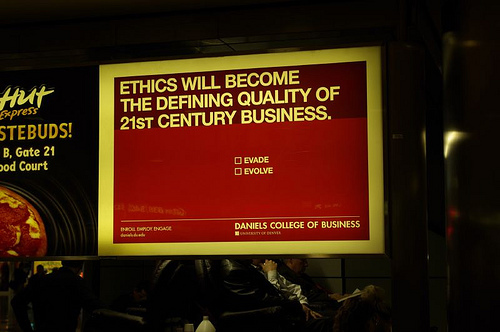 I was particularly drawn to the ethical business image! There are a lot of companies out there who claim to be ethical based on dubious green credentials. For example, i worked with a photocopier lease company who claimed to dispose of toner cleanly and used this as a selling point. But their service agreements, which tied companies into long contracts with heavy liquidated damages, and their lease agreements, which often hid an extra payment for the printer/copier being leased or hired, were far from ethical. My point: ethics is something that as a marketing tool is great – but you have to live the ethical dream right through the business, and not just where it is convenient to do so. Otherwise it can bite. Business ethics is a form of applied ethics that examines ethical principles and moral or ethical problems that arise in a business environment. I also run a printer distribution business but never compromised ethics.